Most materials expand when they are heated, but some do the opposite and shrink, a phenomenon known as negative thermal expansion (NTE). One particular puzzle has been: why is it that ABO3 perovskite materials generally do not exhibit uniaxial negative thermal expansion (NTE) over a wide temperature range, whereas layered perovskite materials of the same chemical family, e.g., A2BO4, often do? In this work, which appears in Nature Computational Materials, PhD student Chris Ablitt has answered this question. Using first principles calculations and symmetry analysis, he has shown that whilst ABO3 perovskites and layered perovskites both have the sort of soft vibrational modes that are needed for NTE, it is only the layered perovskites that additionally have large elastic anisotropy that predispose the material to the deformations associated with NTE. Chris has shown that this elastic anisotropy arises from the combined effect of layering and condensed rotations of oxygen octahedra and it is this feature, unique to layered perovskites of certain symmetry, that allows uniaxial NTE to persist over a large temperature range. This fundamental insight means that symmetry and the elastic tensor can be used as descriptors in high-throughput screening and to direct materials design. This work forms part of Chris Ablitt‘s PhD in the Centre for Doctoral Training in Theory and Simulation of Materials. Chris is supervised by Nicholas Bristowe, Mark Senn and Arash Mostofi. A quotation often attributed to F. C. Frank goes along the lines of, “Crystals are like people — it’s the defects in them that make them interesting”. 2D materials, such as graphene, are no exception and adsorbates on graphene are known to affect many of its remarkable intrinsic properties. Furthermore, these adsorbed impurities can be electrically charged (so called “Coulomb” impurities) and their electronic and optical properties are not only interesting from a purely scientific perspective, but may have important implications for the development of future optoelectronic device technologies based on 2D materials. In a pair of papers published recently, we have developed a multi-scale theory of Coulomb impurities on graphene that combines large-scale density-functional theory calculations, continuum Thomas-Fermi theory and tight-binding models in a parameter-free framework that is able to predict and help interpret the most recent experimental measurements of individual adsorbates on graphene surfaces. Fabiano Corsetti is a post-doctoral research associate in the Department of Materials at Imperial College London, supervised by Arash Mostofi. This work was a collaboration including Johannes Lischner of Imperial College London, Dillon Wong in the group of Mike Crommie at UC Berkeley. J. Muscatello, E. A. Muller, A. 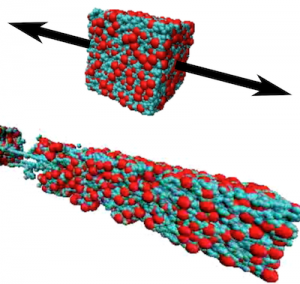 A. Mostofi and A. P. Sutton, Multiscale molecular simulations of the formation and structure of polyamide membranes created by interfacial polymerization, J. Membrane Sci. 527, 180 (2017). One of the greatest societal challenges of the 21st century is to ensure the availability of fresh water to the world’s growing population in the backdrop of significant environmental change. Desalination of sea water to produce fresh water is a promising route to addressing this challenge. Membranes can be used to desalinate sea water via a process known as reverse osmosis. Pressure is applied to sea water on one side of a selectively permeable membrane that allows water to flow through it, leaving behind the ions that cause sea water to be brackish. A common type of membrane is a highly cross-linked polyamide thin layer formed by interfacial polymerisation of two monomers in solution. In these materials the separation of water from ions occurs in a thin layer than may only be a few nanometers thick — by contrast, the a human hair is about 10,000 times thicker. In a paper published recently in the Journal of Membrane Science, Jordan Muscatello has developed a multi-scale model of the interfacial polymerisation process and representative atomic structures of the membrane. Two key observations from this computational study are: (1) the polymerisation process is self-limiting, resulting in a membrane thickness of 5-10 nm, in excellent agreement with experimental measurements; and (2) the membranes form by aggregation of oligomer clusters, with weaker bonding across interfaces between former separate clusters. The resulting morphology may have a direct bearing on transport of small molecules through the membrane where the less dense interfaces may provide easier channels for diffusion. This work was supported by the BP International Centre for Advanced Materials. Jordan Muscatello is a post-doctoral research associate at Imperial College London and was supervised by Adrian Sutton, Erich Muller and Arash Mostofi. M. Khawaja, A. P. Sutton and A. A. Mostofi, Molecular simulation of gas solubility in nitrile butadiene rubber, J. Phys. Chem. B 121, 287 (2017). J. Phys. Chem. B 120, 12700 (2016). Nitrile butadiene rubber (NBR) and it’s hydrogenated relative HNBR are among the most widely used elastomers in the oil and gas industry where they are used to seal components in high temperature and pressure environments. Such seals can suffer permeation-driven failure as a result of absorption of gases that cause swelling and performance degradation. In a pair of papers that have appeared recently in the Journal of Physical Chemistry B, PhD students Mohammed (Musab) Khawaja and Nicola Molinari have developed and used chemically-specific all-atom models of NBR and HNBR to study the properties of these elastomers. In the first paper, Musab studied the solubility of several gases known to be responsible for permeation-driven failure in NBR and found two key results: (1) that the presence of a particular chemical group (C-N cyano groups) in the polymer have a marked impact on the solubility of carbon dioxide and water; and (2) that at elevated pressures and temperatures such as those experienced in oil wells, the relative solubilities of different gases are likely to be different as compared to ambient conditions. These findings have implications for the chemical design of such elastomers for use at elevated temperature and pressure. In the second paper, Nicola Molinari developed and tested all-atom model of HNBR that mimics the experimental process by which HNBR is produced from NBR by hydrogenation and cross-linking. In Nicola’s model, the degree of cross-linking is a tunable parameter that can be used to control some of its properties. This model paves the way for future studies of properties of HNBR, such as the solubility and diffusion of gas molecules, that are determined by chemically-specific interactions. This work was supported by Baker Hughes. Mohammed Khawaja and Nicola Molinari are PhD students in the Centre for Doctoral Training in Theory and Simulation of Materials and they are supervised by Adrian Sutton and Arash Mostofi. Most materials expand when they are heated, but a few do the opposite as a result of certain kinds of atomic vibrations. Ideally, we would like to be able to precisely dial-in a material’s thermal response, but in these complex systems fine control has been elusive. 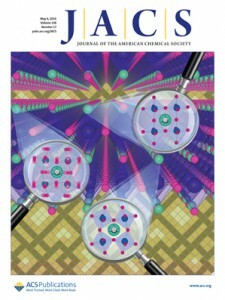 In this work, which appears on the cover of JACS, the layered perovskite Ca3–xSrxMn2O7 is shown to exhibit a switching from a material exhibiting uniaxial negative to positive thermal expansion as a function of x. The switching is shown to be related to two closely competing phases with different symmetries. The negative thermal expansion (NTE) effect is maximized when the solid solution is tuned closest to this region of phase space but is switched off suddenly on passing though the transition. Our results show for the first time that, by understanding the symmetry of the competing phases alone, one may achieve unprecedented chemical control of this unusual property. This work was done in collaboration with Mark Senn at the University of Oxford and others and forms part of Chris Ablitt‘s PhD in the Centre for Doctoral Training in Theory and Simulation of Materials. Chris is supervised by Nicholas Bristowe, Mark Senn and Arash Mostofi. Over the last decade, there has been increasing interest in modelling electronic transport at the atomic scale. In particular, the need to capture the physics of emerging nanostructured electronic devices calls for quantum-mechanical simulations. The Landauer-Buttiker formalism coupled with density functional theory (DFT) is used successfully to model a wide range of transport phenomena. 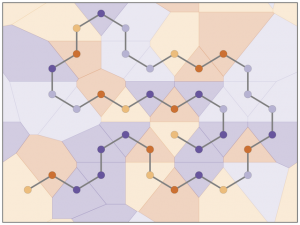 Simulations realistic nanoscale devices containing several thousands, or tens of thousands, of atoms whilst retaining the gold-standard plane-wave accuracy remains a challenge. In this work, we have developed a DFT-based method to investigate Landauer-Buttiker electronic transport in devices containing several thousands of atoms. The implementation is based within the ONETEP linear-scaling DFT code that relies on a minimal set of localised Wannier-like orbitals. As these generalized Wannier functions are optimised with respect to an underlying systematic basis of functions equivalent to a set of plane-waves, the implementation retains the characteristic of controllable accuracy. The method is demonstrated by applying it to study conductivity in carbon nanotube networks and is a step toward the goal of rational design and optimisation of realistic nanoscale devices from first-principles. Carbon nanotubes (CNTs) possess remarkable electronic and physical properties, and many applications have been proposed since their discovery. For any application to be practical, however, these properties must be robust to their local environmental conditions. One technologically-important impurity is water, which may be found not only in the surrounding atmosphere, but also as a result of purification processes that are done in solution. Experimental studies show that water does have an effect on CNT conductivity, yet observations have been contradictory, with both increases and decreases in conductivity observed. A disagreement exists over the effect, and indeed the existence, of charge transfer between water and CNTs. Using large-scale density functional theory calculations, we show that the interaction between water and CNTs is remarkably long ranged, such that it could not be accurately represented in previous calculations in the literature employing smaller system sizes. The dominant effect is due to the classical electrostatic interaction of the water molecule dipole with the electronic charge density of the CNT. This accounts for the vast majority of the redistribution of charge in the CNT, which had previously been misinterpreted as charge transfer. 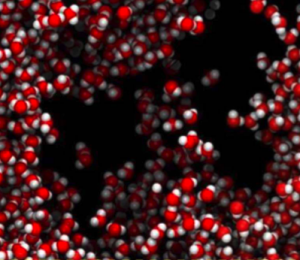 So, with regard to the question posed at the start, water does not dope carbon nanotubes. This work is part of Rob Bell’s PhD. 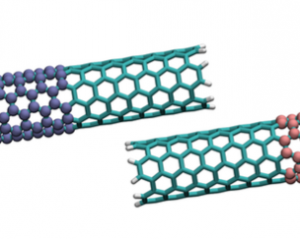 Individual single-walled carbon nanotubes (CNTs) possess remarkable electron transport properties and many applications have been proposed since their discovery. To have a significant technological impact, however, the properties of single CNTs must be scalable to the level of devices and mass production. One approach is to use the CNTs in so-called ‘bulk form’, such as wires and mats that are fabricated as a complex network of many individual CNTs. These systems have attracted considerable interest recently. Their conductance, however, is orders of magnitude lower than the theoretical maximum achievable on the basis of single CNTs and is believed to be largely limited by the slow tunnelling of electrons between CNTs in the network. 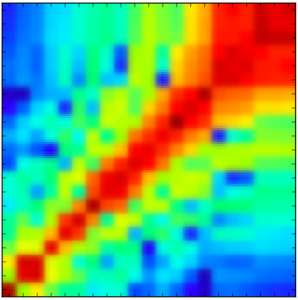 Rob’s theoretical analysis of inter-tube tunnelling between adjacent CNTs identifies a new mechanism to improve the electronic conductance of CNT networks by an order of magnitude. 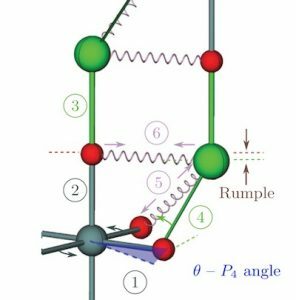 Whilst it has been known theoretically for some time that inter-tube conductance between CNTs of different chirality is strongly suppressed, how this result impacts real CNT networks has not been clear. Previous theoretical and computational approaches have focussed largely on conductance between terminating ends of CNTs and/or considered tunnelling between CNTs of the same chirality. These studies are, therefore, not representative of realistic networks that can consist of relatively well-aligned CNTs in which side-wall tunnelling is significant and in which there are a wide range of chiralities. Using analytical theory based on scattering theory, validated by numerical tight-binding simulations, Rob has shown unequivocally that significant enhancements of inter-tube conductance can arise from relatively weak interactions with the surrounding environment. 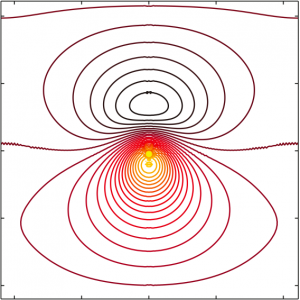 The origin of the enhancement is that these interactions enable momentum-conserving tunnelling to occur by accepting any momentum difference between the initial and final states. The improvement in inter-tube conductance is very general and applies to metallic as well as doped semiconductor CNT networks. A key point is that the interaction with the environment need only be weak, therefore, it can be effected without chemical bonding. A number of possibilities for the experimental realisation and control of such conductance-enhancing interactions are suggested and our results highlight the crucial importance of considering the effect of the environment when studying nano-scale devices. 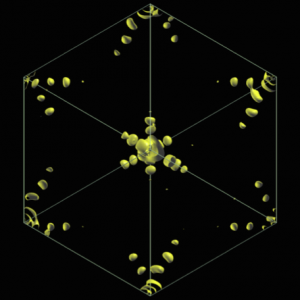 It’s well-known that atomic defects are crucial for the operation of semiconductor devices. Not all defects, however, are desirable. 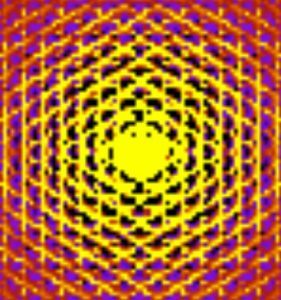 Gold dopants in silicon, for example, introduce electronic levels that sit deep within the band gap of silicon, acting as electron traps, leading to a large decrease in conductivity. Understanding the properties of gold in silicon has also received recent interest due to the use of gold as a catalyst in the growth of semiconducting nanowires in a process that can result in the presence of gold impurities in significant excess of the solubility limit that would be expected in bulk silicon. Fabiano has addressed a long-standing puzzle in the properties of the gold substitutional defect in silicon, namely that there is no electron-paramagnetic resonance (EPR) signal associated with it. This is particularly puzzling since the isoelectronic Pt1- impurity in silicon does show a strong EPR signal. Why, then, does gold, which is adjacent to platinum in the periodic table, behave so differently? This question was first posed by F.G. Anderson [J. Phys. : Condens. Matter 3, 4421 (1991)] and has since remained without a definitive answer. His state-of-the-art first-principles calculations suggest that the reason for the lack of an EPR signal for Au in Si is that this defect is what is known as a “negative-U” center, i.e., the system is thermodynamically stable only when the electronic states associated with the defect are doubly occupied. It is this suppression of unpaired spins associated with the defect that results in the lack of an EPR signal in experiments. The robustness of his results is supported by the quantitative agreement, within chemical accuracy, between the experimentally measured defect level transitions and his calculated predictions. This work was part of Fabiano Corsetti’s PhD.